Anna Burns has written a Man Booker Prize-winning novel that will have you stopping, and shaking your head in wonder at the writing of it. A novel that is not about anything in particular. It provides no names, no places. Well, not as commonly assumed. Pronouns have no place here. Well, not of the usual sort. Characters are known by their descriptors, which saves a lot of mental effort, short circuits the need to associate a name with a relative position or social hierarchy – in orders that undermine assumptions of what we might think as more or less important. There is no need to remember the associations combined with a ‘Michael’, for instance. Rather, we meet ‘third brother-in-law’, or ‘maybe-boyfriend’. With a rare use of capital letters, the novel opens with ‘Somebody McSomebody’ and that’s pretty much as close to a name there is. There is also the milkman, who later becomes Milkman for reasons revealed later in the novel. Milkman is mentioned on the first page, although at this stage he is still the milkman. Of course we already know of a Somebody McSomebody, and first brother-in-law is introduced although introduced isn’t exactly right because no-one is really introduced, they are just there or they are not there. Especially someone like a Somebody McSomebody. This is Belfast after all. In the ‘70s. During the troubles. Not that Anna Burns tells us this, we just come to realise it, which is her genius. In Belfast, during the troubles, everybody already knows everybody so there’s no need to go placing them and saying what they look like or what they wear or anything at all except what is pertinent to in what manner they interact with you. Of course how they interact with you is really to do with how they interact with the person who is telling you the story of how they interacted with her. What we come to know about her – that she reads books while walking, is 18-years-old, is stalked by a dangerous, much-older man, is a middle sister – we learn by the way of it being pertinent to what people, others, have to say about her. And they have a lot to say. Particularly because middle sister finds very little to say to them. In a place like this in a time like this, anything you say can and will be used against you. By somebody. It’s a lot like Thokoza in the early ‘90s, just with fewer and less brutal killings. People believe what they want to believe and there’s little use in trying to make them believe otherwise is something soon discovered. Anna Burns has written a novel out of intimation and, to be direct, it is astounding. Through the audacious voice of the narrator it brilliantly recreates the atmosphere of place and circumstance. It is a voice as captivating as Holden Caulfield in Catcher in the Rye. It is not easy saying that. Not because there is any concern with overstating the case but because comparisons are often odious. But other than the clarity of the character that is conveyed, there are other similarities. Both Holden and middle sister do not fit in, both have unique voices and manner of speaking, both stories are told through how the narrator tells it to us. You can call it first person narration if you like, that is just a term. Anna Burns doesn’t narrate in the first person, she creates the world in which a certain series of events take place in the life of a young woman living at a certain place, at a certain time. A more intimate account of what it was like to be there, then, without mentioning the politics except as much as they cannot not be mentioned when daily life is ruled by the issues, is unlikely to have been written. It is so good it skirts being insane. There are many sentences, many passages that have to be read again, and maybe again, pondering and puzzling and back pedaling to try get exactly what the assemblage of double negatives really comes to mean. Only to have it become more elusive, which is exactly the point. One cannot be accused of saying something if one didn’t really say it, can one? So middle sister believes, would like to believe for surely that is natural. In this she may be out of step, and not really reading the winds. Not really paying attention. And so she unwittingly becomes the centre of a whirlpool. All because a shady older man, a man who no-one knows anything about but knows that he has a hand in making things happen, violent things, things that have to do with the issues, took a fancy to her. 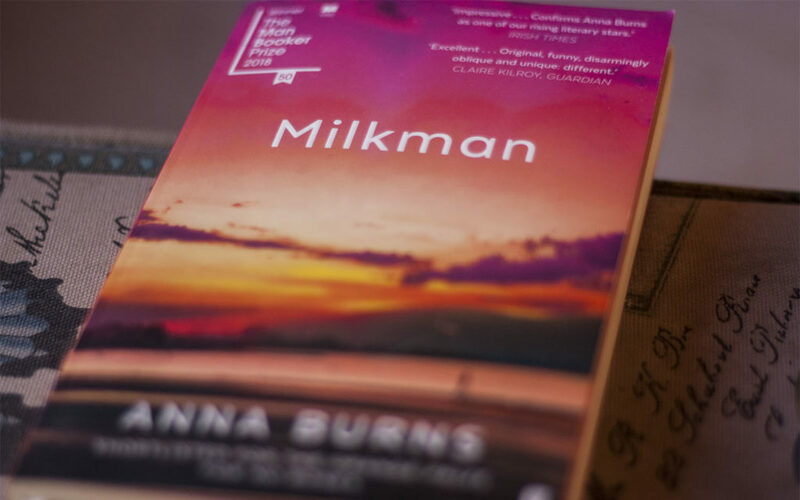 Milkman, by Anna Burns, was published by Faber & Faber in 2018, and distributed in South Africa by Jonathan Ball Publishers.